THE US House of Representatives has proposed a staggering £7.3million ($10million) in funding to aid NASA’s hunt for signs of extraterrestrial life in the cold depths of space. The proposed bill includes two years of funding to “search for technosignatures” from potentially intelligent and developed alien species. The technosignatures would include radio waves which an advanced civilisation could be intentionally blasting into space much like humans are. The Congress bill marks the first time in 25 years the search for extraterrestrial intelligence (SETI) is being given proper funds. However renowned astronomer Dr Jill Tarter, former director of the SETI Institute, warned the bill is far from a done deal. She said: “This is an authorisation bill, not an appropriation bill. “Even if it passes, the appropriators may not provide any SETI funding in their bill. The search for alien life outside of our solar system has generally been focused on the detection of artificially created radio waves. But a revision of SETI’s mission statement could lead to a brand new approach in the hunt for extraterrestrials. 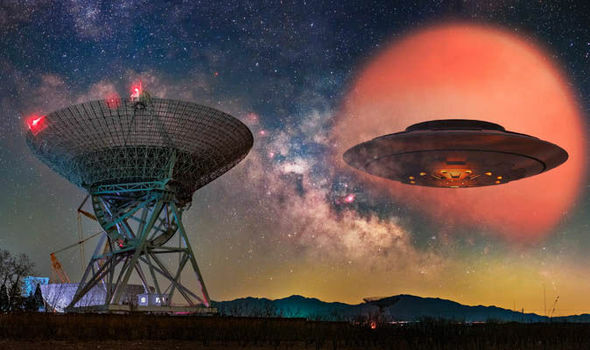 In order to avoid false positives and misleading signals, SETI could employ the help of Artificial Intelligence (AI) to sift through the noise. Dr Tarter has pointed out that UFO hunters often look for signs of intelligence and technology in space that are similar to our own. But the expert argued the hunt for technosignatures is a limited approach because non-human intelligence, technology and language appears in all shapes and forms. For example, chimpanzees have been recognised to have culture and use tools. As such, alien intelligence could take on a completely different and unrecognisable from somewhere out in space. Astrobiologist Nathalie Cabrol, who organised a “Decoding Alien Intelligence” workshop at SETI, said the time has come to search for life “as we do not know it”. In 1992 NASA initiated the SETI programme to build the required instruments to scan the cosmos for signs of extraterrestrial life. However, the SETI initiative was shut down just a year later by Nevada Senator Richard Bryan. But the Congress bill now promises a breath of fresh air for SETI Dr Tarter stressed. The sizeable budget would allow SETI to build new instrumentation and collect data on a global scale.